(?) Riser married Teresa Bagwell, daughter of Buford Bagwell and Betty Ray Brown, after 1965. Entered into rest on Friday, June 13, 2003, Mr. Steven Haskell Bagwell, 47, of Rushing Road, Augusta, husband of Mrs. Julie Murphy Bagwell. Others surviving include his parents, Mr. and Mrs. Johnny Bagwell; son, Steven Cody Bagwell; daughter: Stevi Melissa Bagwell all of Augusta; sister, Pam Pyles, Lake Mary, Fla; as well as many nieces and nephews. Mr. Bagwell, a native of Montgomery, Ala., had made Augusta his home for the past 36 years. He was an avid sports fan and a collector of sports memorabilia. He was employed by the Richmond/Burke Job Training Authority as a Client Services Manager. He enjoyed his work and spoke of his co-workers as part of his family. He was a member of the Burns Memorial United Methodist Church. Steve lived his life for his wife, children and his family. Augusta Chronicle, The (GA) - Sunday, June 15, 2003. He was buried at Hillcrest Memorial Park Cemetery, Augusta, Richmond County, Georgia. Julie Murphy married Steven Haskell Bagwell, son of Johnny Walker Bagwell and Jacquiline Adkins, after 1970. Steven Cody Bagwell is the son of Steven Haskell Bagwell and Julie Murphy. Stevi Melissa Bagwell is the daughter of Steven Haskell Bagwell and Julie Murphy. Jacquiline Adkins was born on 7 February 1933 in Easley, Pickens County, South Carolina. As of circa 1949,her married name was Bagwell. She married Johnny Walker Bagwell circa 1949. Jacquiline Adkins died on 6 May 2018 in Augusta, Richmond County, Georgia, at age 85. She was buried at Hillcrest Memorial Park Cemetery, Augusta, Richmond County, Georgia. Johnny Walker Bagwell married Jacquiline Adkins circa 1949. Julie M. Bagwell is the daughter of Johnny Walker Bagwell and Jacquiline Adkins. Pamela Bagwell is the daughter of Johnny Walker Bagwell and Jacquiline Adkins. Otho Harrison Land was born on 3 June 1894 in Shiloh, Union Parish, Louisiana. He married Lillian Luseal Bagwell, daughter of Andrew Jackson Bagwell Jr. and Emma Harriett Gentry, after 1910. Otho Harrison Land died on 30 October 1959 at age 65. He was buried at Greenwood Cemetery, Ruston, Lincoln Parish, Louisiana. Sandra Carole Bagwell died on 27 June 1948 in Buncombe County, North Carolina. She was born on 27 June 1948 in Buncombe County, North Carolina. She was the daughter of Marvin Howard Bagwell and Henrietta Anderson. Sandra Carole Bagwell was buried at Piney Mountain Methodist Cemetery, Candler, Buncombe County, North Carolina. Leonidias Polk Holbrook was born on 9 October 1890 in Franklin County, Georgia. He married Talulah Magnolia "Nola" Bagwell, daughter of James Dexter Bagwell and Samantha Martha Alberson, after 1907. Leonidias Polk Holbrook died in 1964 in Toccoa, Stephens County, Georgia. He was buried at Stephens County Memorial Gardens, Toccoa, Stephens County, Georgia. Eleanor Ray Meeks Shelburne married Delbert Ray Patterson, son of Buck May Patterson and Alta Mavis Cox, on 30 December 1969 at Virginia Beach, Virginia. Elizabeth J. Brantley was born circa 1851 in Mississippi. She was the daughter of Sidney Prince Brantley and Francis Hawkins. Wilson Green Brantley was born on 8 April 1853 in Calhoun County, Mississippi. He was the son of Sidney Prince Brantley and Francis Hawkins. Wilson Green Brantley died on 25 November 1903 in Robinson, McLennan County, Texas, at age 50. He was buried at Robinson Cemetery, Robinson, McLennan County, Texas. Martha Brantley was born circa 1858 in Mississippi. She was the daughter of Sidney Prince Brantley and Francis Hawkins. William M. Brantley was born circa 1842 in Mississippi. He was the son of Sidney Prince Brantley and Francis Hawkins. Sarah E. Brantley was born circa 1836 in Mississippi. She was the daughter of Sidney Prince Brantley and Francis Hawkins. As of after 1850,her married name was Wood. Sarah E. Brantley married W.G. Wood after 1850. Sarah E. Brantley died in 1908. She was buried at LeFlore Cemetery, LeFlore, LeFlore County, Oklahoma. W.G. Wood was born on 5 August 1828 in Tennessee. He married Sarah E. Brantley, daughter of Sidney Prince Brantley and Francis Hawkins, after 1850. W.G. Wood died on 17 July 1891 in Hope, Hempstead County, Arkansas, at age 62. He was buried at Rose Hill Cemetery, Hope, Hempstead County, Arkansas. Samuel Hawkins was born on 11 October 1786 in South Carolina. He married Nancy Davis on 30 January 1809 at Jackson County, Georgia. Samuel Hawkins died circa 1850 in Mississippi. Nancy Davis was born in 1787 in North Carolina. She married Samuel Hawkins on 30 January 1809 at Jackson County, Georgia. As of 30 January 1809,her married name was Hawkins. Nancy Davis died in 1850 in Calhoun County, Mississippi. Owen J. Owen Jr. was born circa 1872 in Indiana. He was the son of Dr. Owen J. Owen and Mary Angeline Bagwell. 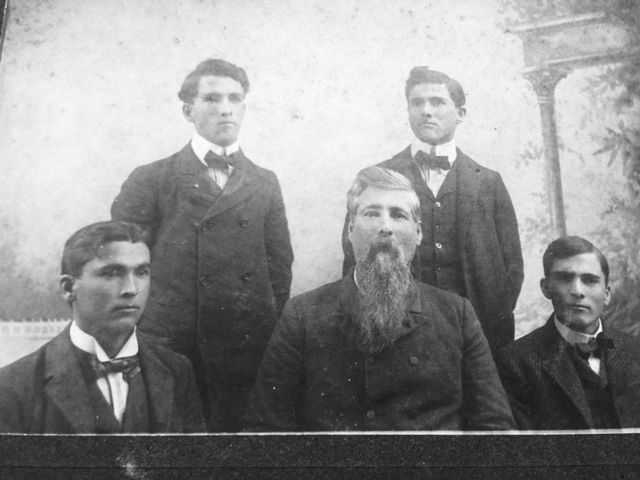 Back Row - Left to Right: Wilkie Milton Owen and William Blackstone Owen. George Emmaunel Owen was born circa 1879 in Arkansas. He was the son of Dr. Owen J. Owen and Mary Angeline Bagwell.